In the highly fluid and fast-changing tournament-poker universe, the dominant trend is toward looser and more aggressive (LAG) play, in which players move chips around at dizzying speeds. 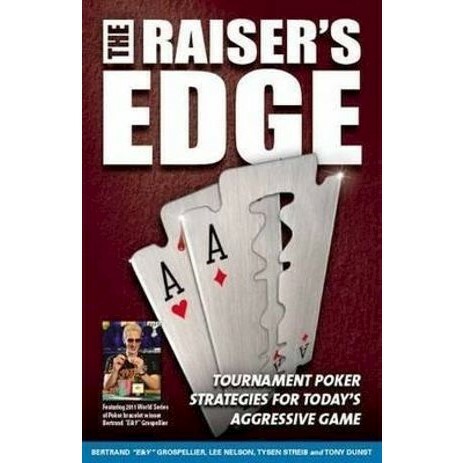 The Raiser's Edge shows you how to adapt to the current state of all stages of tournament play, analysing how and why the LAG and hyper-LAG styles work, and instructing on how to apply-and defend against-them. This book closely examines the many techniques used by the world's most successful players, including 3- and 4- betting, floating and squeezing, smooth-calling and min- raising, thin value betting, and the evolution of the metagame, along with equilibrium strategies based on starting hands and heads-up play. Even the ages and nationalities of your opponents are considered. There's also an extensive bonus chapter on reading tells, contributed by body-language expert Steve Van Aperen. Bertrand "ElkY" Grospellier, one of the hottest tournament-poker players in the world, has teamed up with Lee Nelson and Tysen Streib, authors of the acclaimed advanced tournament strategy book Kill Everyone, and poker star Tony Dunst to pen this groundbreaking title. With tournament poker evolving at a furious pace, serious players need to be ahead of the curve. The Raiser's Edge conveys the powerful state-of-the-art tactics that will get you there fast. Lee Nelson is the top-rated tournament poker player in Australia and Asia, named the Austral-Asia Grand Champion for 2000-2005. In 2005, Lee won the Party Poker World Open with a $400,000 first prize, the $120,000 High-stakes Speed Poker event, and the 7-card stud championship at the Aussie Millions, as well as the pot-limit Omaha event at the Irish Open. Lee also took down the no-limit hold 'em tournament at the St. Maarten Open in late 2004.